Here you can find all information about the cannabis breeder Skunkwerk Genetics. We've collected data about 7 Cannabis Strains breed by Skunkwerk Genetics. 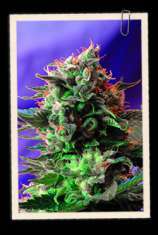 Click on the strains to find more informations, pictures, reviews, comparisons and sources for a variety - and/or check out the Breeder Info here at the page to find out more about Skunkwerk Genetics. Its also possible to visualize all Skunkwerk Genetics strains together with all their Parents or Hybrids with our dynamic maps - check it out! Click here to visualize all Skunkwerk Genetics strains including all known hybrids and descendants with our dynamic map! Here you can watch all Skunkwerk Genetics strains and their ancestors (sorted by origin) with our dynamic strain map! Are proprietary elite genetics are never sourced out. We give every bean we make equal love and due process. All items are created OMRI organically without the use of pesticides, insecticides or fungicides. , We thank you for your interest and will strive to continue to create superior stable genetics for patients in need.